Thallus: (sub-)fruticose, erect and tufted to drooping and subpendent, (1-) 2-3 (-5) cm tall or in non-Sonroan regions occasionally pendent to 7-10 cm long, usually somewhat flaccid and pliant, occasionally very small, with very short, rosette-like aggregated branches occasionally with very short; axils: acute and V-shaped to almost right-angled (but rounded) branches: few to numerous, flattened, strap-shaped to very narrow and linear usually dorsiventral, mostly (0.5-) 1-1.5 (-3) mm wide, often ± broadened at major axils in the lower parts, to c. 5 mm wide there elongated, ± palmately branched to rather regularly dichotomous (dichotomies annual), often twisted, ultimate branches usually 1-2 (-3) mm long, 0.1-0.2 mm wide, blunt or pointed, often forked upper surface: green-gray to pale greenish yellow or pale yellowish green (slowly turning grayish yellow or finally brownish yellow in herbarium), or occasionally distinctly yellow, with age (or when damaged) bleaching to ash-gray to finally almost white but near the base itself often brownish yellow, extreme tips often darkened (brown); matt, sometimes (especially on smaller branches) with weak to strong mottling by paler, irregularly elongated and branched maculae, smooth to rather strongly rugose and pitted, often with an incomplete network of elongate ridges centrally spreading towards the margins; cortex degenerating and weakly cracked in places soredia: finely to coarsely granular marginally, often on ridges and/or margins, or occasionally spreading and confluent usually white (often slightly bluish or blackish-speckled and distinctly contrasting with rest of the surface, but sometimes concolorous with it) medulla: uniformly loose, without hyphal bundles photobiont: mainly confined to a layer just below the greenish side, in small groups, with at most a few clusters of algae near the underside lower surface: concolorous with upper side or more often paler or white (becoming creamy to slightly orange-yellow in herbarium), often dotted or blotched greenish especially towards the tips (more visible without lens than with it), broadly channeled, often with rims formed by the curved-down edge of the upper side (and then often sorediate), but mostly less wrinkled/ridged and pitted than then the upper surface Apothecia: very rare (not seen in material from the Sonoran Region) marginal, substipitate, bowl-shaped then plane, 0.2-0.5 (-1.5) cm diam. 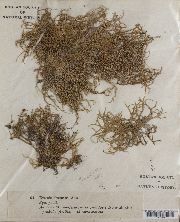 ; disc: red-brown, thalline margin: slightly crenate, underside concolorous with thallus, pitted and wrinkled; hymenium: hyaline, upper part reddish or brownish; paraphyses: conglutinate, filamentous, unbranched, 1 µm thick, tips broadened, yellowish or reddish; hypothecium: pale reddish to brownish, to almost hyaline ascospores: ellipsoid, 7-11 x 4-6 µm Pycnidia: very rare, c. 0.3 mm diam., marginal, immersed, roundish, ostioles dark or black conidia: formed pleurogenously, acicular, straight, 6-7 x 0.5 µm Spot tests: cortex K- (rarely K+ yellow), C-, KC+ yellow (rarely KC-), P-, UV-; medulla P-, K- or + yellow, KC-, C-, UV- or + pale blue Secondary metabolites: cortex with usnic acid (usually major, sometimes ± absent), atranorin, and chloroatranorin, medulla with evernic acid. Substrate and ecology: usually on neutral to acidic bark (stems, branches and twigs), especially of oaks and other broadleaf trees or shrubs (only occasionally on conifers), usually at lower elevations (but up to 1675 m) in areas with high humidity but mainly in sunny, often windswept World distribution: incompletely circumpolar: western North America, Europe; northern Africa and Japan Sonoran distribution: southern California, oak woodland and chaparral, now largely extinct south of Santa Barbara, 60-1400 m, on Quercus or occasionally Baccharis, Heteromeles arbutifolia, Pinus nemorata; occasional in Baja California. Notes: The upper cortex is usually yellowish or greenish, with usnic acid, but rarely (e.g, the Channel Islands) it can be partly or entirely dirty ash-gray or bluish. See Keissler (1960) for formal description of forms and varieties. 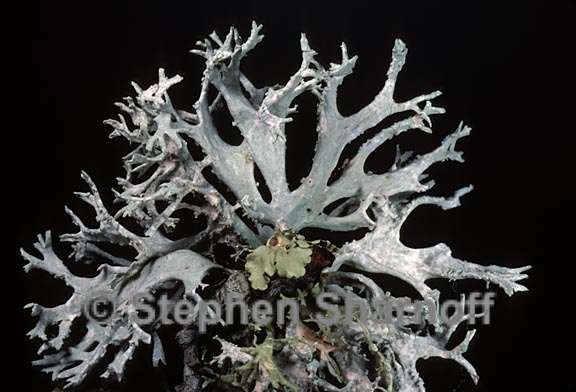 Forms with narrow lobes (often in more shaded habitats) and green specimens may be confused with Ramalina species (especially R. farinacea, with which it is often intermixed), but can distinguished by its more limp thallus and often dichtomous branching. A somewhat unusual morph found occasionally in the Sonoran region has numerous, narrow, elongate, and densely sorediate branches arising mostly near the tips of broad, scarcely branched and mostly non-sorediate lower branches. The relatively few specimens found today in mainland areas around the Los Angeles area are often rather small, poorly developed and distorted.